Cayambe is a Holocene compound volcano which means that it was formed at least 10,000 years ago. 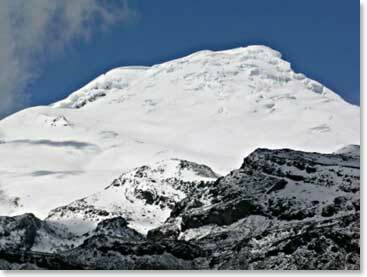 Cayambe is located on the Equator and is the only point on the Equator that has snow! It’s 10:05 a.m on Friday, the 5th of December, 2008. It’s the same time in Montreal, it’s 9:05 a.m. in Texas, and it’s 8:05 a.m. in Salt Lake City and in Alberta, Canada. There are people from all of those locations standing on top of Cayambe right at this minute. The entire BAI team made it to the top virtually at the same time. We had 3 roped teams but we all reached the summit together. I want to congratulate this team on a long hard climb. We had a beautiful day today. If you’ve read the dispatches from our Ecuador trip last year, you might remember that our team made the summit of Cayambe in a total white-out. They were thrilled to be on top but our photographs show only people in their climbing harnesses in the fog. Today was very different. We had clear skies, some clouds building from below, but it’s beautiful scenery. What a great accomplishment! Hi this is Wally and I’m just sending an update after our summit today. It took us about 3 ½ hours to descend, arriving at the Cayambe Hut at 1:30 p.m. We will be going all the way down to the Hacienda tonight but first we are going to relax at the Hut and celebrate our climb today with fresh handmade pizza! Talk to you soon.